Volcanic ash from Iceland has shut down airports across central and northern Europe for a third consecutive day. A crater spews ash and plumes of grit at the summit of the volcano in southern Iceland's Eyjafjallajokull glacier on Saturday. ((Arnar Thorisson/Associated Press))Volcanic ash from Iceland grounded flights across central and northern Europe for a third consecutive day and halted air travel for world leaders who wanted to fly to Poland for the state funeral of President Lech Kaczynski. U.S. President Barack Obama and Canadian Prime Minister Stephen Harper were among leaders staying home instead of travelling to Krakow for the funeral Sunday because of dangerous flying conditions. Delegations from India, Japan, South Korea, Mexico, New Zealand and Pakistan also cancelled plans to attend the funeral because of the latest eruption of Eyjafjallajökull from beneath glacial ice. Russian President Dmitry Medvedev and German Chancellor Angela Merkel said they still planned to attend. Funeral services for Kaczynski and his wife Maria will be held at Wawel Cathedral in the southern city of Krakow. The expansive cloud of high-altitude grit has left airline passengers stranded around the globe since Thursday. 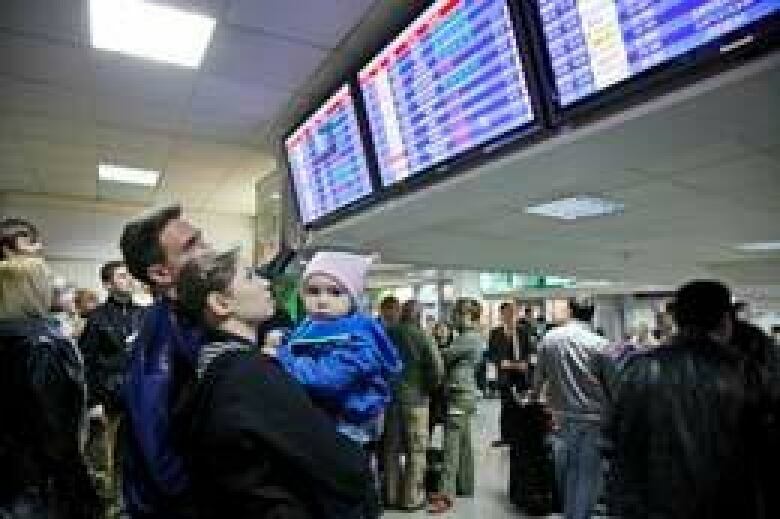 Airline officials have been forced to ground nearly three in four European flights. The cloud of ash is drifting across an area including the United Kingdom, Scandinavia, Poland, northern France and Austria, and is heading for Russia at about 40 km/h. The highly abrasive ash can cause aircraft engines to fail if enough glass particles melt inside the engines and jam the machinery. 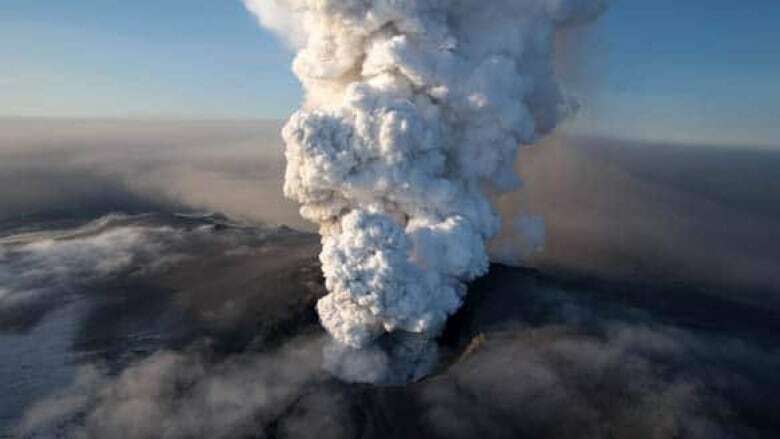 The Icelandic Meteorological Office said the amount of ash in the plume grew late Saturday and that the vast ash cloud is continuing to travel south and southeast. Scientists had planned to fly over the volcano to see how much ice has melted to determine how much longer the eruption could spew the fine, corrosive ash, but the Icelandic Coast Guard said Saturday's flight had been postponed. Aviation experts say the volcanic plume has caused the worst travel disruption that Europe, and the world, has ever seen. At Toronto's Pearson International Airport, dozens of flights were cancelled by Saturday morning, mostly to northern Europe. Passengers are advised to check with their airline to see if their flight will go ahead. The same events were unfolding at other major airports across the country. Air Canada has plans to add extra flights and fly bigger planes to get its stranded passengers moving once Europe's airspace is deemed safe enough to reopen. Airline spokesman Peter Fitzpatrick said there's no way to tell when that will happen. "We've had volcanoes before, but never one situated like this, right in the middle of our flight path. That's what makes this complicated," he said. At Trudeau airport in Montreal, some people from Europe and elsewhere have been forced to camp out because they have nowhere else to go. A young woman from Belgium and her three friends who travelled to Montreal on vacation have been stuck without a way home since Thursday. They were supposed to fly to Paris on a 5 p.m. Air France flight. "It's been two days we've been waiting for a flight, and we're just sitting here, with nothing to eat and nowhere to sleep," the woman told CBC News. She said Air France has not offered them a hotel and they're out of money. They're now waiting for money from their families back home. Peter Hammond took the bus from Ottawa on Friday to catch his flight to Paris. "I'm going to visit my girlfriend that I haven't seen in months and I can't get there, and it's our one-year anniversary on Wednesday. So I'm trying to get there," he said. Hammond even checked before leaving and the airline said the flight wasn't cancelled. He said he's going to camp out at the airport until he can get a flight. Passengers were offered cots at New York City's JFK International Airport. There are concerns that the situation is unlikely to change in the next few days. "Currently the U.K. and much of Europe is under the influence of high pressure, which means winds are relatively light and the dispersal of the cloud is slow," said Graeme Leitch, a meteorologist at Britain's National Weather Service. "We don't expect a great deal of change over the next few days."